For other people named Frank Costello, see Frank Costello (disambiguation). Frank "the Prime Minister" Costello (Italian: [kosˈtɛllo]; born Francesco Castiglia [franˈtʃesko kasˈtiʎʎa]; January 26, 1891 – February 18, 1973) was an Italian-American Mafia gangster and crime boss. Costello rose to the top of American organized crime, controlled a vast gambling empire, and enjoyed political influence. Nicknamed "The Prime Minister of the Underworld," he became one of the most powerful and influential mafia bosses in American history, eventually leading the Luciano crime family (later called the Genovese crime family), one of the Five Families that operate in New York City. Costello was born Francesco Castiglia on January 26, 1891 in Lauropoli, a frazione of the town of Cassano allo Ionio in the province of Cosenza in Italy. In 1895, he boarded a ship to the United States with his mother and his brother Edward to join their father, who had moved to New York City's East Harlem several years earlier and opened a small neighborhood Italian grocery store. While Costello was still a boy, his brother introduced him to gang activities. At 13, he had become a member of a local gang and started using the name Frankie. Costello committed petty crimes and went to jail for assault and robbery in 1908, 1912, and 1917. In 1918, he married Lauretta Giegerman, a Jewish woman who was the sister of a close friend. That same year, Costello served ten months in jail for carrying a concealed weapon. After his release, he decided to avoid street rackets and use his brain to make money as a criminal. Forgoing the use of violence as a road to success and wealth, Costello claimed that he never again carried a gun. He did not return to jail for 37 years. 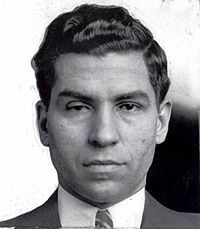 While working for the Morello gang, Costello met Charlie "Lucky" Luciano, the Sicilian leader of Manhattan's Lower East Side gang. The two Italians immediately became friends and partners. Several older members of Luciano's family disapproved of this growing partnership; they were mostly old-school mafiosi who were unwilling to work with anyone who was not Sicilian. To Luciano's shock, they warned him against working with Costello, whom they called "the dirty Calabrian." Along with Italian-American associates Vito Genovese and Tommy "Three-Finger Brown" Lucchese, and Jewish associates Meyer Lansky and Benjamin "Bugsy" Siegel, the gang became involved in robbery, theft, extortion, gambling and narcotics. The Luciano-Costello-Lansky-Siegel alliance prospered even further with the passage of Prohibition in 1920. The gang went into bootlegging, backed by criminal financier Arnold "the Brain" Rothstein. The young Italians' success let them make business deals with the leading Jewish and Irish criminals of the era, including Dutch Schultz, Owney "the Killer" Madden and William "Big Bill" Dwyer. Rothstein became a mentor to Costello, Luciano, Lansky and Siegel while they conducted bootlegging business with Bronx beer baron Schultz. In 1922, Costello, Luciano, and their closest Italian associates joined the Sicilian crime family led by Joe "the Boss" Masseria, a top Italian underworld crime boss. By 1924, Costello had become a close associate of Hell's Kitchen's Irish crime bosses Dwyer and Madden. He became deeply involved in their rum-running operations, known as "The Combine"; this might have prompted him to change his last name to the Irish "Costello." On November 19, 1926, Costello and Dwyer were indicted on federal bootlegging charges. They were accused of bribing two U.S. Coast Guardsmen, presumably so that they would not disturb the unloading of liquor from boats in New York Harbor. The largest boat in the Combine fleet could carry 20,000 cases of liquor. In January 1927, the jury deadlocked on the bootlegging charges for Dwyer and Costello. In 1926, Dwyer was convicted of bribing a Coast Guard official and sentenced to two years in jail. After Dwyer was imprisoned, Costello took over the Combine's operations with Madden. This caused friction between Madden and a top Dwyer lieutenant, Charles "Vannie" Higgins, who believed he should have been running the Combine instead of Costello. Thus, the "Manhattan Beer Wars" began between Higgins on one side, and Costello, Madden, and Schultz on the other. At this time, Schultz was also having problems with gangsters Jack "Legs" Diamond and Vincent "Mad Dog" Coll, who had begun to rival Schultz and his partners with Higgins' help. Eventually, the Costello-Madden-Schultz alliance was destroyed by New York's underworld. Costello continued to be a very influential gangster throughout the 1920s. He kept close associates Luciano, Lansky and Siegel involved in most of his gambling rackets, which included punch cards, slot machines, bookmaking and floating casinos. Costello eventually became known as the "Prime Minister of the Underworld" for his cultivation of associations and business relationships with New York's criminals, politicians, businessmen, judges, and police officials. As he followed the "Big Three" ideology of mixing crime, business and politics, Costello's underworld influence grew. His fellow gangsters considered him an important link between the Mafia and Tammany Hall, New York's Democratic political machine. This relationship gave Costello and his associates, including Luciano, the opportunity to buy the favors of politicians, judges, district attorneys, cops, city officials and anyone else they needed to bribe in order to freely run their criminal operations. In 1927, Costello, Luciano, and former Chicago gangster John "Johnny the Fox" Torrio organized a group of top East Coast rum-runners into a large bootlegging operation. This gang was able to pool their Canadian and European liquor sources, maximize profits, minimize overhead, and gain an advantage over their competition. The operation was known as the "Big Seven Group", the first concrete move in organizing the American underworld into a national crime syndicate. In May 1929, Costello, Luciano, Torrio, Lansky, and South Jersey crime boss Enoch "Nucky" Johnson hosted a meeting in Atlantic City, New Jersey. This convention included the Big Seven Group and top crime leaders from across the nation. It was the first true underworld meeting and the biggest step in forming a National Crime Syndicate that would control criminal operations, dictate policy, enforce rules, and maintain authority in the national underworld. Masseria and Salvatore Maranzano were not invited because their Old World ideas ran counter to the convention's goals. By 1928, Costello and Luciano were considered ambitious, powerful and fearsome gangsters on the rise. But an internal conflict in the Italian underworld sidetracked Costello and his associates. Masseria was facing a challenge from Maranzano, a recent arrival who was born in Castellammare del Golfo, Sicily. When Maranzano arrived in New York in 1925, his access to money and power let him quickly set up rum-running, bootlegging, extortion and gambling operations that directly competed with Masseria, Costello's boss. On October 10, 1928, Masseria eliminated his top rival for the coveted "boss of all bosses" title, Brooklyn boss Salvatore "Toto" D'Aquila. But Masseria still had to deal with the powerful and influential Maranzano and his Castellammarese Clan. Masseria became an underworld dictator, requiring absolute loyalty and obedience from the other four New York families. In 1930, he demanded and received a $10,000 tribute (equivalent to $149,980 in 2018) from the leader of Maranzano's crime family. The Castellammarese leader, Nicolo "Cola" Schirò, fled New York in fear, leaving Maranzano as the new leader. By 1931, a series of killings in New York, Detroit, and Chicago involving Castellammarese members and associates led Maranzano and his family to declare war against Masseria and his allies, including Costello, Luciano, Genovese and Joe Adonis. Another Masseria ally was the large Mineo crime family, whose members included Costello associates Albert "The Mad Hatter" Anastasia, Carlo Gambino, and Frank Scalice. The Castellammarese clan included Joseph "Joe Bananas" Bonanno and Stefano Magaddino; the Profaci crime family, which included Joseph Profaci and Joseph Magliocco, along with former Masseria allies; and the Riena family, which included Gaetano "Tom" Riena, Tommaso "Tommy" Gagliano and Gaetano Lucchese. The Castellammarese War between the Masseria and Maranzano factions raged on for almost two years, devastating the Prohibition-era operations and rackets that the New York families controlled with the Irish crime groups. The breach was inevitable because of a fundamental philosophical difference between the Old World crime bosses and their younger underlings. Masseria and Maranzano, who had begun their careers in Italy, were known as "Mustache Petes" because they were unwilling to work with non-Italians and skeptical of dealing with non-Sicilians; Costello, Luciano and their group of "Young Turks" believed that as long as there was money to be made, they should deal with anyone. The war cut into gang profits and completely destroyed the some crime family members' rackets. Several of the younger gangsters on both sides realized that if the war did not stop soon, the Italian families would lose influence to the Irish. The Young Turks decided to end the war and secretly planned to eliminate one "Mustache Pete" immediately, then bide their time and kill the other one. Luciano and Costello set their plan in motion by secretly agreeing to betray Masseria if Maranzano would end the war. On April 15, 1931, Masseria was gunned down in a Coney Island restaurant by Anastasia, Genovese, Adonis and Siegel. Luciano then took over Masseria's family, with Costello as his consigliere. That brought an end to the Castellammarese War, which had led, according to some estimates, to about 60 deaths among gangsters. Then, at a secret meeting in Upstate New York, Maranzano surprised everyone by naming himself "boss of all bosses." Although they had planned to get rid of Maranzano anyway, Costello and Luciano came to believe that Maranzano was even more power-hungry than Masseria and moved up their timetable. Maranzano served as boss of bosses until September 10, 1931, when he was killed in his 9th floor Helmsley Building office in Manhattan by gunmen posing as Internal Revenue Service agents. Hired by Lansky and Luciano, the shooters allegedly included Schultz lieutenant Abraham "Bo" Weinberg and Murder, Inc. gunman Samuel "Red" Levine. In 1931, after the Masseria and Maranzano murders, Luciano became the leader of the new Luciano crime family, with Genovese as underboss and Costello as consigliere. Costello quickly became one of the biggest earners for the Luciano family and began to carve his own niche in the underworld. He controlled the slot machine and bookmaking operations for the family with associate Philip "Dandy Phil" Kastel. Costello placed approximately 25,000 slot machines in bars, restaurants, cafes, drugstores, gas stations, and bus stops throughout New York. In 1934, Mayor Fiorello La Guardia confiscated thousands of Costello's slot machines, loaded them on a barge, and dumped them into the river. Costello's next move was to accept Louisiana governor Huey Long's proposal to put slot machines throughout Louisiana for 10% of the take. Costello made Kastel overseer of the Louisiana slot operation. Kastel had the assistance of New Orleans mafioso Carlos "Little Man" Marcello. Costello brought in millions of dollars in profit from slot machines and bookmaking to the Luciano family. In 1936, Luciano was convicted of running a prostitution ring and sentenced to 30 to 50 years in state prison. He attempted to rule the crime family from prison with the help of Costello and Lansky, but found it too difficult. Luciano finally named Genovese as acting boss. In 1937, Genovese was indicted for a 1934 murder and fled to Italy to avoid prosecution. Luciano then appointed Costello as acting boss. Genovese's departure left Costello in firm control of the Luciano family. With the help of his top caporegimes Adonis, Anthony Strollo, Anthony Carfano and Michael "Trigger Mike" Coppola, the family ran smoothly and undeterred. Costello's rule was very profitable, with slot machines in New Orleans with Marcello, illegal gambling in Florida and Cuba with Lansky, and illegal race wires with Siegel in Los Angeles. Costello also enjoyed more political influence than any other mobster in the country. But unlike Luciano, he did not believe in drug trafficking. This aversion to selling drugs was not shared by Genovese, a known drug dealer. Costello was a popular boss within the crime family; he equitably shared the profits from family operations and did not demand a large cut of his underlings' criminal earnings. He apparently was the owner of New York's third biggest poultry meat supply firm and a chain of MeatMarts. By 1946, Luciano's prison sentence was commuted and he was deported to Italy. With Genovese also exiled to Italy, Costello remained boss of the Luciano family. After Genovese's return to the U.S. and the dismissal of the 1936 murder charge, he began a campaign to regain the family leadership from Costello. Genovese started building loyalty among Luciano soldiers by lending them money or by doing them favors that they someday would have to reciprocate. The resentment Genovese felt for Costello was multiplied by the fact that Genovese was no longer a top boss in the family; he was just a capo in charge of a crew of soldiers. However, Genovese was treated as a "don" by the capos and soldiers who committed most of the violent crimes. In contrast, Costello had the support of the capos and soldiers who ran the white collar rackets and the family's many legitimate investments. Costello's position as a Commission member and his popularity as boss kept him safe from any assassination attempt or power move by Genovese. To unseat Costello, Genovese needed more support from the Luciano family and the other Commission members. He was also dissuaded from a direct attack on Costello by the strength of underboss, Guarino "Willie Moore" Moretti, a Costello cousin and staunch ally who commanded a small army of soldiers in New Jersey. From May 1950 to May 1951, the U.S. Senate conducted a large scale investigation of organized crime, commonly known as the Kefauver Hearings, chaired by Senator Estes Kefauver of Tennessee. The entire country was transfixed by the parade of over 600 gangsters, pimps, bookmakers, politicians and mob lawyers testifying before Congress, showcased on television. By this time, Costello had become a powerful and respected underworld figure; however, he still craved the respectability of high society. Costello allegedly consulted a psychiatrist on achieving this goal, but ultimately failed to gain legitimate respectability. During the hearings, Costello became the star attraction, being billed as America's #1 gangster and the de facto leader of Tammany Hall. As the underworld grapevine put it, "Nobody in New York City can be made a judge without Costello's consent." Costello agreed to testify at the hearings and not take the Fifth Amendment, in contrast to all the previous underworld figures to take the stand. The Special Committee and the television networks had agreed not to broadcast Costello's face, only his hands. During the questioning, Costello nervously refused to answer certain questions and skirted around others. When asked by the committee, "What have you done for your country, Mr. Costello? ", the raspy-voiced Costello's reply evoked a rare laugh at the hearings: "Paid my tax!" Costello eventually walked out of the hearings. Costello found the 1950s to be very trying, as the high visibility he received during the Kefauver Hearings brought additional law enforcement and media scrutiny. However, his greatest troubles began with the assassination of Moretti, whose mental condition had caused him to reveal some embarrassing details at the hearings. As a result, the Commission ordered Moretti's elimination, which happened October 4, 1951, in a New Jersey restaurant. 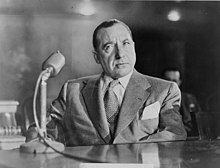 In addition to Moretti's death, Costello was convicted on contempt of Senate charges in August 1952 for walking out of the hearings and went to jail for 18 months. Released after 14 months, he was charged with tax evasion in 1954 and sentenced to five years imprisonment. Costello served 11 months of this sentence before it was overturned on appeal. In 1956, Costello was again convicted and sent to prison. In early 1957, he was again released on appeal. Genovese finally made his move on the embattled Costello. It started in 1956 when Adonis, a powerful Costello ally, chose deportation to Italy over a long prison sentence. His departure left Costello weakened, but Genovese still had to neutralize one more powerful Costello ally, Anastasia, who had taken over the Morello crime family after the disappearance of boss Vincent Mangano and the murder of brother Philip Mangano on April 14, 1951. With the addition of Anastasia to the Commission in 1951, the so-called "Liberal faction," which included Costello, began to get stronger. In 1953, another Liberal ally, boss Tommy Lucchese, was added to the Commission. As a result, the "Conservative faction" that had controlled the Commission from 1936 through 1953 was now rivaled by the Costello-Anastasia-Lucchese alliance. However, Genovese converted this reversal into an opportunity for conflict by approaching Lucchese and Anastasia underboss Carlo Gambino about switching sides. The potential reward in eliminating Costello and Anastasia was control of their crime families by Genovese and Gambino. Genovese had patiently waited ten years after his deportation to Italy to make his final move against Costello, and the time had finally arrived. On May 2, 1957, soon after Costello's release from prison, as he was walking to the elevator in the lobby of The Majestic, his Manhattan apartment building, he was shot in the head by Genovese driver and protege Vincent "Chin" Gigante. Before taking the shot, Gigante called out, "This is for you, Frank!" On hearing this, Costello turned his head. Gigante fled the scene thinking the fallen Costello was dead. But Gigante's outburst had saved Costello and left him with only a scalp wound. After the abortive hit, Gigante went into hiding. He finally turned himself in to face a mob trial, but Costello refused to identify Gigante as the shooter, resulting in his acquittal. Genovese now ordered all Luciano family members loyal to him to show their support by attending a meeting at his New Jersey mansion. All the family's capos showed up except Carfano (who was murdered for this insult on September 25, 1959). Even though the attempt on Costello's life had failed, Genovese went on to appoint himself boss of the Luciano family. He then called for a national Commission meeting to discuss Mafia affairs in New York and other important issues. Genovese was now in charge of what would be called the Genovese crime family; exiled in Italy, Luciano was powerless to stop him. After Costello recovered from the assassination attempt, he and Genovese made peace before the 1957 Apalachin meeting. Costello agreed to abdicate as boss in favor of Genovese. In return, Genovese agreed that Costello would keep his gambling operations in Louisiana and Florida and his legitimate business interests. Though Costello was officially demoted to the rank of soldier within the family, he was never looked at as less than a top-level boss. During his retirement, Costello was still known as "The Prime Minister of the Underworld." He still retained power and influence in New York's Mafia and remained busy throughout his final years. Cosa Nostra bosses and old associates such as Gambino and Lucchese still paid visits to Costello at his Waldorf Astoria penthouse, seeking advice on important Mafia affairs. Costello's old friend Meyer Lansky also kept in touch. Costello occupied himself with gardening and displayed some of his flowers at local horticultural shows. On February 20, 1961, the United States Supreme Court upheld a lower court order that stripped Costello of his U.S. citizenship. But on February 17, 1964, the same court set aside a deportation order for Costello, citing a legal technicality. In early February 1973, Costello suffered a heart attack at his Manhattan home and was rushed to Doctors Hospital in Manhattan, where he died on February 18. Costello's sedate memorial service at a Manhattan funeral home was attended by 50 relatives, friends, and law enforcement agents. Costello is buried in a Mausoleum at Saint Michael's Cemetery in East Elmhurst, Queens. Costello has been portrayed in several movies, including by actors Feodor Chaliapin, Jr. in My Brother Anastasia (1973), James Andronica in Gangster Wars (1981), Carmine Caridi in Bugsy (1991), Costas Mandylor in Mobsters (1991), and by Kirk Baltz in the television movie Kingfish: A Story of Huey P. Long (1995). The character of Vito Corleone in the book and 1972 film The Godfather is based on a composite of mid-20th Century New York Mafia figures, perhaps chief among them Costello. The Corleone character featured similar mannerisms (including a raspy voice) and political connections, as well as many events from his real life. (Like Costello, Don Corleone voices disapproval of the drug traffic, which he labels a "dirty business.") Marlon Brando, who played Corleone, apparently used tapes of Costello from the Kefauver Hearings as the basis for the character's accent. Costello was the godfather to CBS News reporter and Federal Bureau of Investigation (FBI) Assistant Director for the Office of Public Affairs John Miller. Miller's father and Costello were close friends. Referenced in Allen Ginsberg's poem, "Hadda Be Playing on the Jukebox." The line is written, "It had to be FBI chief J. Edgar Hoover / and Frank Costello syndicate mouthpiece / meeting in Central Park, New York weekends, / reported Time magazine". The poem was later performed live (with music) by the band Rage Against The Machine on the album Live & Rare. The film The Departed features an Irish mob boss named Frank Costello (played by Jack Nicholson) in present-day Boston. Nicholson's character is not related to the real-life Costello except in name; the character was based on Boston mobster "Whitey" Bulger, with the film plot based on Infernal Affairs, a 2002 Hong Kong thriller film. Costello is portrayed by Anthony DiCarlo in AMC's docudrama series The Making of the Mob: New York. ^ Sifakis, Carl (1987). The Mafia Encyclopedia. New York City: Facts on File. ISBN 0-8160-1856-1. ^ The Five Families. MacMillan. Retrieved 2008-06-22. ^ "33 MEN ARE INDICATED AS RUM IMPORT RING". New York Times. November 19, 1926. Retrieved 18 October 2014. ^ "COSTELLO JURORS CLEAR 8, SPLIT ON 6 IN LIQUOR RING TRIAL". New York Times. January 21, 1927. Retrieved 18 October 2014. ^ Maas, Peter. The Valachi Papers., by Peter Maas. ^ a b "Frank Costello Dies of Coronary at 82; Underworld Leader" (PDF). New York Times. February 19, 1973. Retrieved 6 June 2012. ^ "Costello Loses Citizenship Plea". New York Times. February 21, 1961. ^ "Court Sets Aside Order For Costello Deportation" (PDF). New Yort Times. February 18, 1964. Retrieved 19 October 2014. ^ "Costello Buried After Brief Rites" (PDF). New York Times. February 22, 1973. Retrieved 27 June 2012. Brennan, Bill (1962). The Frank Costello Story. Derby, CT: Monarch Books. Katz, Leonard (1973). Uncle Frank: The Biography of Frank Costello. New York: Drake Publishers. Wolf, George (1974). Frank Costello: Prime Minister of the Underworld. New York: William Morrow & Company. Raab, Selwyn. (2006). Five Families: The Rise, Decline, and Resurgence of America's Most Powerful Mafia Empires. New York, N.Y.: St. Martin's Press. ISBN 0-312-30094-8. Wikimedia Commons has media related to Frank Costello.